The lead metal is widely used for cosmetics, contraceptive, ornaments, enamels, currency, construction, lead-acid battery, etc. The research objective was to evaluate the impact of the Trivedi Effect®-Consciousness Energy Healing Treatment on the physicochemical and thermal properties of the lead sample using the modern analytical technique. 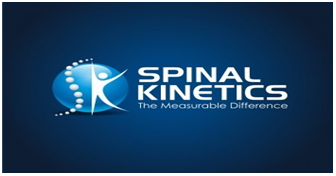 The sample was divided into two parts, one part of the sample was considered as the control sample, while the second part of the sample was received the Biofield Treatment remotely by a renowned Biofield Energy Healer, Gopal Nayak and was termed as the treated sample. The particle size values were significantly increased by 18.08% (d10), 55.42% (d50), 1328.55% (d90), and 782.79% [D (4,3)], thus the specific surface area was significantly decreased by 32.7% in the treated sample compared with the control sample. The powder XRD peak intensities and crystallite sizes were significantly altered from 31.21% to 140.79% and -3.05% to 142.47% respectively; whereas, the average crystallite size was significantly increased by 49.42% in the treated sample compared to the control sample. The latent heat of fusion was significantly increased by 6.53% in the treated sample compared with the control sample. The Trivedi Effect® might be responsible for the generation of the new polymorphic form of lead which could have better powder flowability, and more thermally stable compared with the untreated sample. The Biofield Energy Treated sample might reduce the lead poisoning of the people continuously associated with the industries manufacturing paint, pipe, food, and alloys. The thermally stable treated lead also be advantageous for the metal industry. Lead (Pb) is a chemical element used by the human being since form prehistoric period. It is a less unreactive post-transition metal. Lead is found with four natural stable isotopes (mass numbers of 204, 206, 207, and 208) together with other five short-lived radioisotopes [1,2]. The ancient Egyptians used lead for the cosmetics, ornaments, glasses, glazes, enamels, and sinkers in fishing nets for the first time. The lead is also used by many other civilizations in the world for the currency, writing material, construction, wire drawing, contraceptive, stimulant, making amulets, etc . It is plenty available in Australia, Ireland, China, Russia, Mexico, Peru, Portugal, and the United States . Some of the physicochemical properties of lead, including ductility, inertness, low melting point, and high density has numerous beneficial roles for the application point of view. It is also used in the shotgun pellets, ballast in sailboat keels, scuba diving weight belts, protective sheath for underwater cables, architectural metals in roofing material, flashing, cladding, gutters and gutter joints, and on roof parapets; statues and sculptures; balancing the wheels of cars; lead-acid batteries; solder for electronics [2,4-8]. It is used due to its lubricating qualities for making the copper alloys such as brass and bronze to increase machinability. It is used in the research laboratory for the Oddy test to detect the aldehydes, organic acids, acidic gases in museum materials etc . It is used as oxidants, colouring agents, glass, candles, plastic, semiconductors, polyvinyl chloride coating of electrical cords. The semiconductors are also made from lead i.e, lead telluride and lead selenide, which are used in photovoltaic cells and infrared detectors . In the biological system, the role of lead is not clear . A report from the Agency for Toxic Substances and Disease Registry explained that lead has the most damaging effects on the human being, which can enter in the body through consumption of food (65%), water (20%) and air (15%), which may result in the bioaccumulation of lead . It causes the toxicity in the body by interfering with the enzyme functions, i.e., mimicking and relocating other metals which act as cofactors in many enzymatic reactions or binding to the sulfhydryl groups, which are found in many enzymes . The symptoms of the lead poisoning are nephropathy, degradation of the myelin sheaths and numbers, decreases neuronal growth, interferes with neurotransmission routes, weakness in the fingers, colic-like abdominal pains, wrists, and ankles, increases blood pressure, miscarriage in pregnant women, anemia, reduce fertility in males, etc. [2,13]. The heavy metal content in the water, air, soil, food, nutraceuticals, and pharmaceuticals, of the cultivated land, need to reduce. All over the world lead poisoning are the life-threatening health hazard and a major concern. Several efforts are made to reduce the lead contamination. The Trivedi Effect®-Consciousness Energy Healing Treatment has shown significant alteration in the crystallite size, particle size, surface area, and thermal properties of metals [14-16]. The Trivedi Effect® is natural and the only scientifically proven phenomenon in which an expert can harness this inherently intelligent energy from the Universe and transmit it anywhere on the planet through the possible mediation of neutrinos . Every living organism possesses a unique, para-dimensional electromagnetic field surrounding the body, which originates from the continuous movements of the charged particles, ions, cells, heart function, brain functions, and blood/lymph flow inside the body known as the “Biofield”. The Biofield Energy Therapy (energy medicine) has been reported to have substantial outcomes against various disease conditions and to maintain the overall quality of life . The National Institutes of Health/National Centre for Complementary and Alternative Medicine (NIH/ NCCAM) recommend and included the Energy therapy under the Complementary and Alternative Medicine (CAM) category along with other therapies, medicines and practices such as traditional Chinese herbs and medicines, Ayurvedic medicine, naturopathy, homeopathy, Qi Gong, Tai Chi, Reiki, hypnotherapy, acupuncture, acupressure, deep breathing, yoga, meditation, chiropractic/osteopathic manipulation, special diets, massage, progressive relaxation, relaxation techniques, guided imagery, healing touch, movement therapy, pilates, Rolfing structural integration, mindfulness, essential oils, aromatherapy, cranial sacral therapy and applied prayer (as is common in all religions, like Christianity, Hinduism, Buddhism and Judaism). The CAM therapy that has been accepted by the most of the U.S. population [19,20]. The Trivedi Effect®-Consciousness Energy Healing Treatment has also been reported with significant outcomes altering the characteristic properties of different organic compounds [21,22], ceramics and polymers [23,24], nutraceutical/ pharmaceutical compounds [25,26], microbes [27,28], cancer cells , livestock , crops , etc. This study was performed to evaluate the impact of the Trivedi Effect®-Consciousness Energy Healing Treatment on the physicochemical and thermal properties of lead powder sample using particle size analysis (PSA), powder X-ray diffraction (PXRD), and differential scanning calorimetry (DSC). The lead powder sample was purchased from Alpha Aeser, India and the other chemicals required during the experiments were of the analytical standard also available in India. The test sample (lead powder) was divided into two parts. One part of the test sample was received the Trivedi Effect®-Consciousness Energy Healing Treatment remotely under standard laboratory conditions for 3 minutes by the renowned Biofield Energy Healer, Gopal Nayak, India, and known as the Biofield Energy Treated sample. However, the other part of the test sample did not receive the Biofield Energy Treatment considered as the control sample, but, the sample was treated with a “sham” healer. The “sham” healer did not have the knowledge about the Biofield Energy Treatment. After that, the Biofield Energy Treated and untreated test sample were both kept in sealed conditions and further characterized using PSA, PXRD, and DSC analytical techniques. Where SControl and STreated are the surface area of the control and the Biofield Energy Treated lead, respectively. Where k is the equipment constant (0.94), G is the crystallite size in nm, λ is the radiation wavelength (0.154056 nm for Kα1 emission), β is the full-width at half maximum (FWHM), and θ is the Bragg angle . Where ΔHControl and ΔHTreated are the latent heat of fusion of the control and the Biofield Energy Treated lead, respectively. The particle size distribution data of both the control and the Biofield Energy Treated lead powder are presented in Table 1. 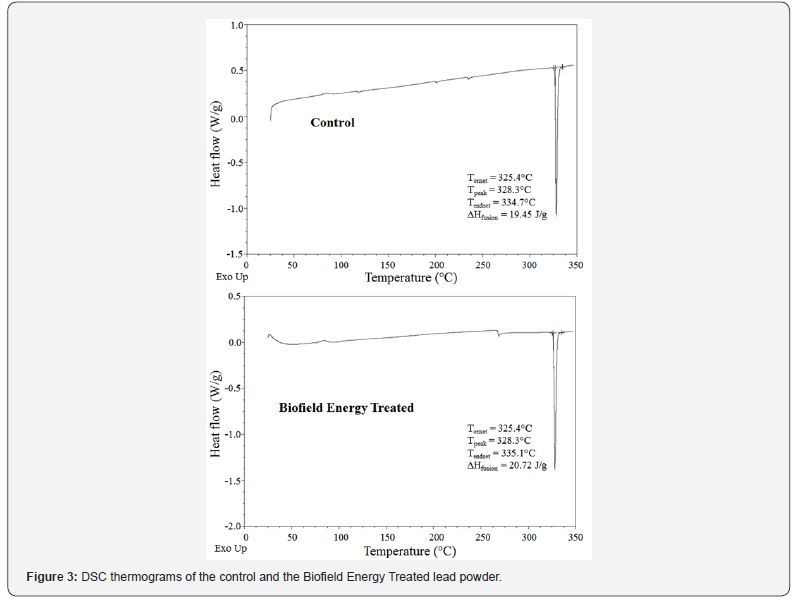 The particle size distribution curve of the Biofield Energy Treated powder sample was significantly different compared to the control sample. One extra peak was observed in the case of the Biofield Energy Treated sample compared to the control sample (Figure 1). The particle size values of the control powder sample at d10, d50, d90, and D (4,3) were 15.354 μm, 36.386 μm, 85.948 μm, and 45.501 μm, respectively (Table 1). Correspondingly, the particle sizes of the Biofield Energy Treated powder sample at d10, d50, d90, and D (4,3) were 18.13 μm, 56.55 μm, 1227.806 μm, and 401.678 μm, respectively (Table 1). As a result, the particle size values in the Biofield Energy Treated lead powder were significantly increased at d10, d50, d90, and D (4,3) by 18.08%, 55.42%, 1328.55%, and 782.79%, respectively compared to the control sample (Table 1). The specific surface area of the Biofield Energy Treated lead powder (0.142 m2/g) was significantly decreased by 32.7% compared with the control sample (0.211 m2/g) (Table 1). These results suggested that the Trivedi Effect®-Consciousness Energy Healing Treatment might reduce the intermolecular bond energy of the lead molecules responsible for increasing the particle size of the lead particle. The researcher has scientifically proven that when the particle size increases, the surface area of the particle decreases which may help in enhancing the shape, flowability, and appearance of the sample [37,38]. Hence, the improved powder flowability, lower the solubility, and bioavailability of the Biofield Energy Treated lead powder sample would be observed. Low bioavailability of the treated lead powder sample might be helpful to minimize the accident of lead poisoning of the people associated with the manufacturing industry utilizing lead as a raw material or by the lead-based product and industrial waste. The X-ray diffractograms of the control and the Biofield Energy Treated powder samples showed sharp and intense peaks Figure 2 which indicated that both the samples were crystalline. The PXRD peaks in the control sample were observed at Bragg’s angle (2θ) equal to 28.45°, 31.15°, 36.17°, 48.48°, 52.13°, 61.99°, 65.07°, and 76.63° (Figure 2). Similarly, the Biofield Energy Treated sample showed peaks at Bragg’s angle (2θ) equal to 28.51°, 31.26°, 36.25°, 48.57°, 52.2°, 62.11°, 65.2°, and 76.95° (Figure 2). The control and the Biofield Energy Treated sample showed the highest peak intensity at 2θ equal to 31.15° and 31.26°, respectively (Table 2). 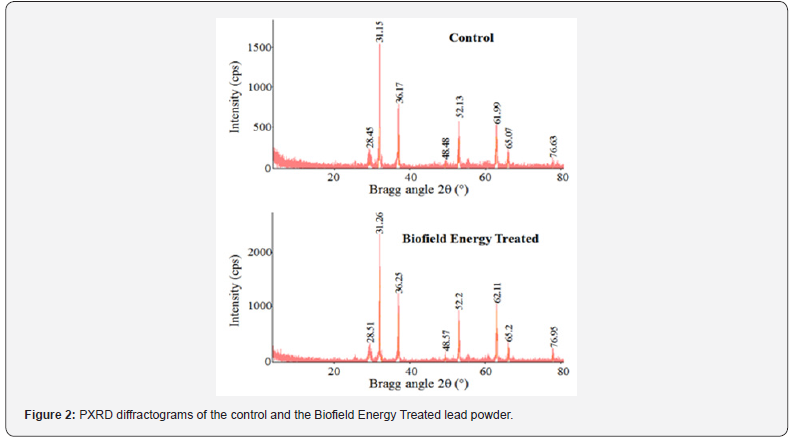 The peak intensities of the Biofield Energy Treated lead powder sample were increased ranging from 31.21% to 140.79% compared with the control sample. Likewise, the crystallite sizes of the treated lead were significand’s altered ranging from -3.05% to 142.47% compared to the control sample (Table 2). Finally, the average crystallite size of the Biofield Energy Treated sample (600.13 nm) was significantly increased by 49.42% compared with the control sample (401.63 nm). The peak intensities and crystallite sizes of the Biofield Energy Treated sample were significantly altered compared to the control sample. The peak intensity of each diffraction face of the crystalline compound changes according to the crystal morphology , and alterations in the PXRD pattern provide proof of the polymorphic transitions [40,41]. The significant alteration in the crystal morphology in the Biofield Energy Healing Treatment lead sample probably leads to the formation of the new polymorphic form via neutrinos oscillation . Different polymorphic forms of pharmaceuticals have a significant effect on drug performance, such as bioavailability, therapeutic efficacy, and toxicity, due to change in their physicochemical properties from the parent form [42,43]. Thus, the Biofield Energy Treated lead sample would be the better option for the manufacturing industry using lead as a raw material. The control and the Biofield Energy Treated lead samples showed a sharp endothermic peak at 328.3°C in the DSC thermogram (Figure 3). The melting point of the Biofield Energy Treated sample did not alter compared to the control sample. But, the latent heat of fusion (ΔHfusion) of the Biofield Energy Treated sample (20.72 J/g) was significantly increased by 6.53% compared with the control sample (19.45 J/g) (Table 3). Any alteration in the ΔHfusion can be attributed to the disrupted molecule chains and the crystal structure . Thus, it is assumed that the Trivedi Effect ®-Consciousness Energy Healing Treatment might be responsible for the improved the thermal capacity of the Biofield Energy Treated lead sample compared with the control sample. The improved thermal stability of the Biofield Energy Treated lead powder might be advantageous for restricting it from thermal degradation compared to the control sample. These experimental data suggest that the Trivedi Effect®- Consciousness Energy Healing Treatment has shown a significant impact on the particle size, surface area, crystallite size, and thermal properties of the lead sample. The particle size values of the Biofield Energy Treated lead powder sample were significantly increased by 18.08%, 55.42%, 1328.55%, and 782.79% at d10, d50, d90, and D (4,3), respectively compared to the control sample. Therefore, the specific surface area of the Biofield Energy Treated lead powder was significantly decreased by 32.7% compared with the control sample. The powder XRD diffractograms of the control and the Biofield Energy Treated lead sample showed the sharp and intense peaks indicating that both the samples were in crystalline form. The peak intensities of the treated powder sample were significantly increased ranging from 31.21% to 140.79% compared with the control sample. Similarly, the crystallite sizes of the treated sample were significantly altered ranging from -3.05% to 142.47% compared to the control sample. Overall, the average crystallite size of the treated sample was significantly increased by 49.42% compared with the control sample. The ΔHfusion was significantly increased by 6.53% in the Biofield Energy Treated sample compared with the control sample. The Trivedi Effect®- Consciousness Energy Healing Treatment might be responsible for the generation of the new polymorphic form of lead which could have better powder flowability and more thermally stable compared with the untreated sample. The Biofield Energy Treated lead powder might reduce the lead poisoning of the people continuously associated with the industries manufacturing paint, pipe, food, mining, plastic, glass, chemical, and alloys. The improved thermal stability of the Biofield Energy Treated lead might be very much advantageous for the metal industry. IAEA - Nuclear Data Section (2017) Livechart - Table of Nuclides - Nuclear structure and decay data. International Atomic Energy Agency. United States Geological Survey (2017) Lead Mineral Commodities Summaries p. 96-98. Parker RB (2005) The New Cold-Molded Boatbuilding: From Lofting to Launching. Wooden Boat Books. Krestovnikoff M, Halls M (2006) Scuba Diving. Dorling Kindersley. Putnam B (2003) The Sculptor’s Way: A Guide to Modelling and Sculpture. Dover Publications. Gulbinska MK (2014) Lithium-ion Battery Materials and Engineering: Current Topics and Problems from the Manufacturing Perspective. Springer p. 96. Gail Gali Beiner, Miriam Lavi, Hadas Seri, Anna Rossin, Ovadia Lev, et al. (2015) Oddy tests: Adding the analytical dimension. Collection Forum 29(1-2): 22-36. Rogalski A (2010) Infrared Detectors (2nd edn.). CRC Press, USA. John Emsley (2011) Nature’s Building Blocks: An A-Z Guide to the Elements. Oxford University Press. Toxic Substances Portal-Lead (2007) Agency for Toxic Substances and Disease Registry. Navas Acien A, Guallar E, Silbergeld EK, Rothenberg SJ (2007) Lead exposure and cardiovascular disease-A systematic review. Environ Health Perspect 115(3): 472-482. Trivedi MK, Mohan R, Branton A, Trivedi D, Nayak G, et al. (2015) Evaluation of atomic, physical, and thermal properties of bismuth oxide powder: An impact of biofield energy treatment. American Journal of Nano Research and Applications 3(6): 94-98. Trivedi MK, Mohan R, Branton A, Trivedi D, Nayak G, et al. (2015) Evaluation of biofield energy treatment on physical and thermal characteristics of selenium powder. Journal of Food and Nutrition Sciences 3(6): 223-228. Trivedi MK, Mohan TRR (2016) Biofield energy signals, energy transmission and neutrinos. American Journal of Modern Physics 5(6): 172-176. Mary Koithan (2009) Introducing complementary and alternative therapies. J Nurse Pract 5(1): 18-20. Trivedi MK, Branton A, Trivedi D, Nayak G, Panda P, et al. (2016) Gas chromatography-mass spectrometric analysis of isotopic abundance of 13C, 2H, and 18O in biofield energy treated p-tertiary butylphenol (PTBP). American Journal of Chemical Engineering 4(4): 78-86. Trivedi MK, Branton A, Trivedi D, Nayak G, Sethi KK, et al. (2016) Gas chromatography-mass spectrometry based isotopic abundance ratio analysis of biofield energy treated methyl-2-napthylether (nerolin). American Journal of Physical Chemistry 5(4): 80-86. Trivedi MK, Branton A, Trivedi D, Nayak G, Mishra RK, et al. (2015) Characterization of physicochemical and thermal properties of biofield treated ethyl cellulose and methyl cellulose. International Journal of Biomedical Materials Research 3(6): 83-91. Trivedi MK, Branton A, Trivedi D, Shettigar H, Nayak G, et al. (2015) Assessment of antibiogram of multidrug-resistant isolates of Enterobacter aerogenes after biofield energy treatment. J Pharma Care Health Sys 2: 145. Trivedi MK, Branton A, Trivedi D, Shettigar H, Nayak G, et al. (2015) Antibiogram typing of biofield treated multidrug resistant strains of Staphylococcus species. American Journal of Life Sciences 3(5): 369- 374. Trivedi MK, Branton A, Trivedi D, Nayak G, Mondal SC, et al. (2015) Effect of biofield treated energized water on the growth and health status in chicken (Gallus gallus domesticus). Poult Fish Wildl Sci 3: 140. Trivedi MK, Branton A, Trivedi D, Nayak G, Gangwar M, et al. (2015) Evaluation of vegetative growth parameters in biofield treated bottle gourd (Lagenaria siceraria) and Okra (Abelmoschus esculentus). International Journal of Nutrition and Food Sciences 4(6): 688-694. Trivedi MK, Sethi KK, Panda P, Jana S (2017) A comprehensive physicochemical, thermal, and spectroscopic characterization of zinc (II) chloride using X‑ray diffraction, particle size distribution, differential scanning calorimetry, thermogravimetric analysis/ differential thermogravimetric analysis, ultraviolet-visible, and Fourier transform‑infrared spectroscopy. Int Pharm Investig 7(1): 33-40. Trivedi MK, Sethi KK, Panda P, Jana S (2017) Physicochemical, thermal and spectroscopic characterization of sodium selenate using XRD, PSD, DSC, TGA/DTG, UV-vis, and FT-IR. Marmara Pharmaceutical Journal 21(2): 311-318. (1997) Desktop X-ray Diffractometer “MiniFlex+”. The Rigaku Journal 14(1): 29-36. Zhang T, Paluch K, Scalabrino G, Frankish N, Healy AM, et al. (2015) Molecular structure studies of (1S,2S)-2-benzyl-2,3-dihydro-2- (1Hinden-2-yl)-1H-inden-1-ol. J Mol Struct 1083: 286-299. Langford JI, Wilson AJC (1978) Scherrer after sixty years: A survey and some new results in the determination of crystallite size. Journal of Applied Crystallography 11(2): 102-113. Graham Buckton, Anthony E Beezer (1992) The relationship between particle size and solubility. International Journal of Pharmaceutics 82(3): 7-10. Mikiyasu Inoue, Izumi Hirasawa (2013) The relationship between crystal morphology and XRD peak intensity on CaSO4.2H2O. Journal of Crystal Growth 380: 169-175. Kaisar Raza, Pramod Kumar, Shanti Ratan, Ruchi Malik, Shweta Arora (2014) Polymorphism: The phenomenon affecting the performance of drugs. SOJ Pharm & Pharmaceutical Sciences 1(2): 10. Harry G Brittain (2009) Polymorphism in pharmaceutical solids in Drugs and Pharmaceutical Sciences. 192, (2nd edn. ); Informa Healthcare USA. Censi R, Di Martino P (2015) Polymorph Impact on the Bioavailability and Stability of Poorly Soluble Drugs. Molecules 20(10): 18759-18776. Zhao Z, Xie M, Li Y, Chen A, Li G, et al. (2015) Formation of curcumin nanoparticles via solution-enhanced dispersion by supercritical CO2. Int J Nanomedicine 10: 3171-3181.